Advice on avoiding hepatitis B, hepatitis C and HIV transmission using highly visual cartoon graphics and straightforward language to give clear messages: keep it clean, protect yourself, get tested, get treated. For groups at high risk of blood borne virus infection such as prisoners and injecting drug users. Get out of jail BBV free! Hard hitting visuals and explicit language describe the risks of blood borne virus (BBV) transmission and preventative strategies. Aimed primarily at male inmates in prison or close accomodation settings. Cartoon virus characters demonstrate the risks of BBVs and how to protect yourself. Aimed particularly at women whose perspective can be neglected in traditional materials. Wallet sized concertina leaflet giving advice on protecting yourself from BBVs for prisoners and IDUs. 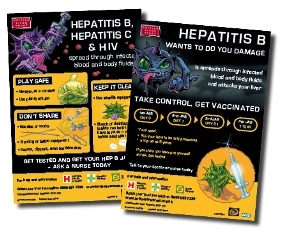 The leaflet includes a hepatitis B vaccination schedule and space to record jabs received. Are you injecting Hep C? Handy small double sided card giving key facts on transmission of Hepatitis C and how to stay safe. Visit our downloads page to download any of the above publications for free.